Samaritan PAD æfingatæki er ætlað þeim sem kenna skyndihjálp þar sem m.a er farið yfir notkun á Samaritan PAD 500 hjartastuðtæki. Allar aðgerðir á tækinu eru forritaðar á þann hátt að þær líki eftir mögulegum aðstæðum, sem upp geta komið eins og um notkun á Samaritan PAD 500 hjartastuðtæki væri að ræða. Allar skipanir eru framkvæmdar með fjarstýringu sem fylgir tækinu. Tækið talar á íslensku. Tæki er hlaðið með rafmagni en fjarstýring gengur fyrir rafhlöðum. Burðartaska og rafskaut fylgja með. Realistic. Voice and visual prompts, CPR Rate Advisor™ and CPR coaching match those of the corresponding HeartSine samaritan PAD defibrillator. Likewise, size and shape are the same, but unique labeling, membrane color, and Pad-Pak™ color are designed to prevent inadvertent use in an actual emergency. Simulates the Full Range of “Real Life” Scenarios. The multi-function remote control enables you to select among six AHA/ERC scenarios for live demonstrations or training. The SAM 450P Trainer remote control provides the training instructor with the flexibility to choose the appropriate CPR Rate Advisor prompts based on the student’s CPR compression rate. One remote control can operate multiple trainer units at a time (within a range of 10-15 feet /3-5 meters). The Trainer also is compatible with any CPR manikin system. Appropriate for All Skill Levels. The Trainer can be used by businesses to train employee first responders on the use of the HeartSine samaritan PAD. In addition, it meets the needs of professional trainers, either teaching first-time lay users or refreshing experienced emergency responders. Cost-Effective. The Trainer is powered by a rechargeable battery. 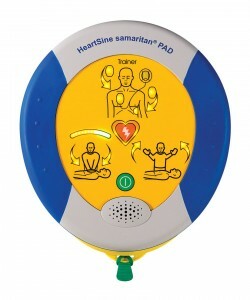 Electrode pads are cost-effective and reusable, and mimic the Pad-Pak battery/pad cartridge unique to the HeartSine samaritan PAD defibrillator. Cable rewind mechanism. Easy replacement of pads and cables after each session reduces time spent resetting system. Rechargeable Battery. The Trainer’s rechargeable battery operates up to seven hours—a full day of training—on a single charge, and recharges in just four hours. Battery status indicator. LED indicates charging status (while not in use) or one hour of remaining battery life (while in use). Pause Button. Temporarily stops, then resumes the training scenario to enable the trainer to offer additional explanation and support to the class. Selectable Training Scenarios: 1. SHOCK ADVISED (SA) condition, followed by CPR. 2. NO SHOCK ADVISED (NSA) condition, followed by CPR. 3. CHECK PADS, followed by an SA condition and CPR.